As emphatic victories go, this one might prove to be the most significant in this year’s race for the Premier League title. 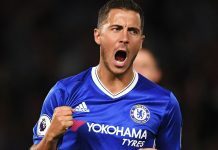 A 3-0 victory for Chelsea over Everton at Goodison Park might just be the last hurdle that the Blues need to overcome in order to be crowned champions at the end of the season. 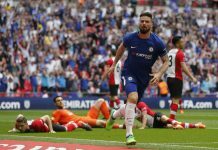 Three second-half goals doomed the Toffees and put Chelsea just three wins away from guaranteeing that the Premier League trophy returns to Stamford Bridge. In all honesty, this was quite a test of Chelsea’s resolve. Goodison Park hasn’t been kind to the Blues as of late, losing six matches in their last ten trips to face Everton, and with Tottenham matching Chelsea at every step, a slip-up away from home could prove costly. Fortunately, Chelsea didn’t let that happen, and a world-class strike from Pedro on the hour mark opened the scoring in the match, and from there, the result was almost assured. 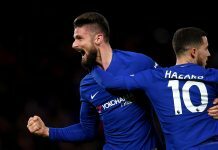 Goals from Gary Cahill and Willian made sure that the three points were in the bag, and Chelsea face three matches out of their last four at home and should be far easier on paper, considering those opponents are all in the bottom half of the table. However, it didn’t all go Chelsea’s way. The first half was quite competitive, especially since Everton have been on their own good run of form, winning eight consecutive home matches. It was Everton who got off to the better start. Dominic Calvert-Lewin immediately got Goodison Park buzzing when he hit the inside of Thibault Courtois’ post just two minutes into the match. Romelu Lukaku was the quickest to react to the rebound, but Gary Cahill was there to prevent the hosts from opening the scoring. Diego Costa and Eden Hazard both scored midweek against Southampton, and the two Chelsea danger men combined for Chelsea’s first clear opening on 10. Costa’s clever turn on the halfway line allowed the Brazilian-born striker to have a run at the Everton back four, and his pass for Hazard allowed the Belgian to skip past Martin Stekelenberg only to fire his shot into the side netting. Lukaku, the Premier League’s leading goal scorer, nearly added to his tally when he intercepted Cesar Azpilicueta’s headed clearance, but could only drag his shot wide. Chelsea’s best chance of the half came through Costa, who headed the ball to himself to escape Phil Jagielka’s attention but volleyed his shot over the bar with the goal at his mercy. Chelsea finally broke the deadlock in the second half when Pedro turned Phil Jagielka with a clever little flick before firing a bullet of a shot into the top corner of the net, leaving Stekelenberg reaching for air. From then on, Everton looked to find the equaliser, but Chelsea never looked in much trouble and looked like the goal had settled a few nerves. Gary Cahill’s ninth goal of the season wasn’t his prettiest, but they all count just the same. Eden Hazard’s drilled free kick from the left was parried by Stekelenberg right into the shin of the England centre back and into the net, giving Chelsea a 2-0 lead. Cesc Fabregas and Willian both came on late as substitutes and both had a part to play in the final goal. Costa’s little reverse pass freed Fabregas inside the penalty area, and Willian simply was left to pass the ball into the net from the Spaniard’s cut-back to simply reinforce Chelsea’s control of the second half. Next articleHow Would a Double Rank Among Chelsea’s Achievements?